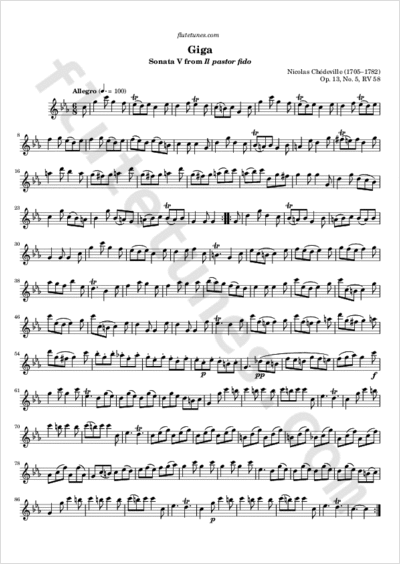 This gigue is the fourth movement of the fifth of the Il pastor fido sonatas, first published in 1737 and traditionally attributed to Antonio Vivaldi. The actual composer, Nicolas Chédeville, made a secret agreement with Jean-Noël Marchand to publish a collection of his own compositions as Vivaldi's Op. 13. Chédeville supplied the money and received the profits, all of which was recorded in a notarial act. This may have been an attempt to give his instrument, the musette, the endorsement of a great composer which it lacked.